Recall that Osinbajo was in Kigali, the capital of Rwanda, last week. He was one of the special guests at the celebration of the 25th anniversary of the genocide that punctuated the peace of that country in 1994. To mark the event, Osinbajo was among leaders who laid wreaths and performed the lighting of the memorial flame. Speaking with journalists later, Nigeria’s Vice-President said leaders across different sections of society must caution against acts that could cause disorder. He said a lot of African countries would not want to see a repeat of what happened in Rwanda. 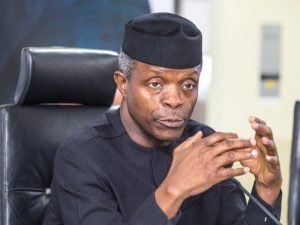 “If you listened to some of the speeches here today, it is very obvious that the wounds for Rwanda were very deep and they are still healing,” Osinbajo noted. About 800,000 people (mainly the minority Tutsi) were reportedly killed in that pogrom. Ethnic tensions worsened when, on April 6, 1994, some gunmen shot down the plane carrying the then President, Juvenal Habyarimana, and his counterpart from Burundi, Cyprien Ntaryamira. Everyone on board, including the two presidents, who were Hutu, died in the incident. Hutu extremists blamed the rebel group called the Rwandan Patriotic Front (RPF), led by Paul Kagame (the current President), as being behind the incident. They set up radio stations and newspapers, which urged people to “weed out the cockroaches,” meaning, kill the Tutsi. The situation was such that even priests and nuns joined in the killing spree. After about 100 days of the crisis, the RPF, backed by the Ugandan army, stormed Kigali, took over power, and stopped the killings. Today, Rwandans don’t identify themselves by their ethnic origin. It has been outlawed. They are first and foremost, Rwandans, not Hutu or Tutsi. They are enjoying relative peace and the country is doing better economically than many African countries, including Nigeria. Its economy now grows at 7 per cent a year. What is the situation in Osinbajo’s Nigeria? Pathetic, is the simple answer. So far, the number of deaths in Africa’s most populous country runs into millions, as against Rwanda’s 800,000. Do we talk about the current killings in Kaduna, the massacres in Benue, Plateau, Zamfara, Borno, Yobe and many others? A year ago, former Chief of Army Staff, Lt. Gen. Theophilus Danjuma (retd), pointedly accused the Nigerian Army of aiding Fulani herdsmen in their killing spree across the country. He urged other Nigerians to defend themselves because the military, as presently constituted, would not defend them. In July 2017, this same Danjuma, together with retired Generals Zamani Lekwot, Joshua Dogonyaro, and some other Christian elders, launched similar acerbic attacks on the leadership of the country. They expressed sadness that Nigeria was drifting dangerously towards another war, judging from the many regional agitations in the country. However, Intersociety agrees with Danjuma and Co. In a statement last week, the civil society group said Nigeria was likely the next theartre of the second genocide on the African continent. According to the group, the circumstances or factors that led to the Rwandan genocide are very much visible under the present political dispensation. It said over 17,850 lives had been lost since the present government came to power in mid 2015. The deaths involve alleged 2,403 government killings (Christians, Shiites and Christian/Muslim women and children); 6,250 (Christians allegedly killed by Fulani herdsmen); 4,600 mostly Muslims (killed by Zamfara bandits, including 3,526 killed in Zamfara, and over 1,000 killed along Birnin Gawari and its environs in Kaduna) and 4,600 Christians and collateral Muslim deaths by Boko Haram insurgents and allied others. Thousands of others have also been killed through armed robbery, kidnapping, murder, communal strife and so on. Do we talk about the genocide against the Igbo between 1967 and 1970? In that singular war, over three million people lost their lives. After the war, the government of General Yakubu Gowon instituted the three R’s: Reconciliation, Reconstruction and Rehabilitation. The reconciliation has largely been observed in the breach. Today, Ndigbo feel more alienated from the scheme of things in Nigeria than before. The President is from the North. The Vice-President is from the South-West. The Senate President and the Speaker of the House of Representatives are from the North. Even in the current permutations and arrangements for the principal officers of the 9th National Assembly, the South-East is relegated and not reckoned with. The head of the judiciary is also from the North. The President consciously or unconsciously appointed almost all northerners as heads of the security agencies in the country. A country that has this kind of lopsided arrangement despite the federal character principle as enshrined in Section 14 (3) of the 1999 Constitution (as amended) is doomed. Ironically, Nigeria was at the forefront of the fight against the apartheid regime in South Africa some years back. But it has chosen to ignore similar discriminatory tendencies perpetrated by the powers that be in the country. This is why an Nnamdi Kanu commands a lot of followers in the South-East today. He tells the people what they want to hear. And some of them are ready to follow him till death do them part. In terms of reconstruction, you judge for yourself how much of that has taken place in the South-East. Many of the federal roads and other infrastructure are seriously begging for attention. The Second Niger Bridge has become a major instrument for propaganda and politicking. Successive governments claimed to have allocated billions for the construction of the bridge. But so far, the bridge is not yet in place. Until it is completed and inaugurated, nobody should tell us any bogus story again about that bridge. As for rehabilitation, it is the Igbo who have rehabilitated themselves. These are hardworking people who by nature do not depend on anybody. They move to other zones and states and do not hesitate to develop such places. Even with the ‘abandoned property’ saga in Rivers State immediately after the war, Igbo currently have massive investments in Port Harcourt, Lagos, Abuja and elsewhere across the country. Naturally, this has brought about some form of envy and hate speech against the tribe. Igbo are usually the victims of any riot in any part of the country. At such times, hoodlums vandalise their shops and loot them. Recently, a video clip of a certain lunatic went viral on the social media. In the video, the man castigated the entire tribe and made all sorts of banal, idiotic and sweeping statements against the Igbo. In the aftermath of the destruction of some polling units in Lagos by thugs during the February 23, 2019, presidential election, some individuals linked the near lynching of one of the thugs by an angry mob to the Igbo. The interpretation was that the Igbo have come to Yorubaland to fight the owners of the land. Some say they must leave Yorubaland because they are evil and troublesome. This type of stigmatisation and hate speech was partly what caused the Rwandan genocide. We are very good at it in Nigeria. If youths burn down pipeline in any Niger Delta area, for instance, the general refrain will be that Ijaw youths committed the crime. Not many people bother to cross-check their information with a view to sieving the chaff from the wheat. To show how serious the Nigerian situation is, the Washington-based Fund for Peace recently ranked Nigeria as the 14th most unstable country in the world. This is out of 178 countries assessed in the 2019 Fragile States Index. Crisis-ravaged countries such as Cameroon, Burundi and Niger Republic are said to have scored better than Nigeria. The giant of Africa is only better than such countries as Yemen (the most fragile state in 2019), South Sudan, Somalia, Syria, DR Congo, Chad, Afghanistan, Iraq and a few others. Finland is the most stable country in the world. It is closely followed by Norway, Switzerland and Denmark. We will not get tired of calling for the restructuring of this country. That is one major thing that will bring about genuine peace. Secondly, we should acknowledge and admit that a lot of injustice has been meted out to certain groups in the country. Telling ourselves the home truth through a Truth and Reconciliation Commission may go a long way to heal the wounds of unjust killings in some parts of the country. Above all, we should resolve as a people to do away with hate speech, stigmatisation and verbal violence that create unnecessary tension and conflicts. Establishing state police to tackle every local situation before it escalates will go a long way.